We just got back from an amazing European vacation! Flew to Barcelona, Spain, then spent the next 2+ weeks in northern Italy. 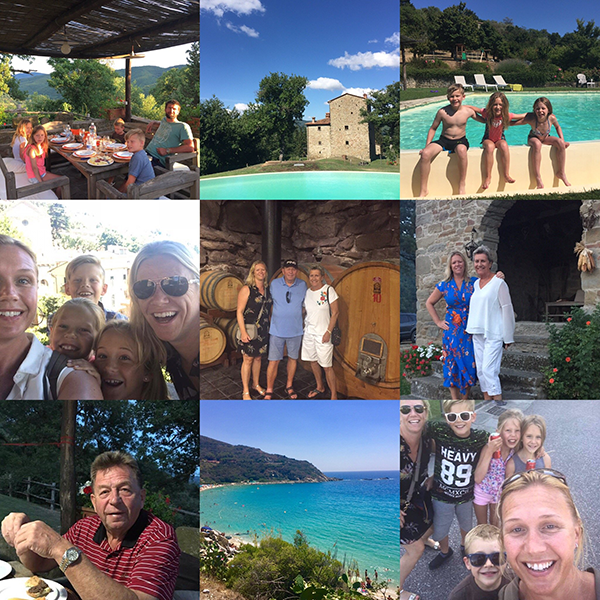 The kids and I traveled solo the first week while my husband worked hard at home, then we met up with my sister and parents in Tuscany in a historic villa from the 14th century. We celebrated my dad's 70th birthday with wine tasting and home-cooked Italian meals from our host Paola. Bellisimo! Learned a ton of Italian as most people don't speak English, and the kids thought Venice was wild with no streets. It was fascinating to arrive Venice by boat and learn how Venice was built in the 5th century! The "Floating City" consists of 118 small islands connected by numerous canals and bridges. Couldn't be more different than California.